Zika virus is the latest health scare pushed by officialdom. The modus operandi of our would-be masters is to deceive us into thinking there is fire, when we can't even smell any smoke. And for the masses who have lost touch with reality, accepting the dictates of experts as unquestioned fact, the scare about Zika can feel very real. That's the whole point, to make us feel as though there is something to fear, when in fact there is nothing to fear but fear itself. The following is a compilation of Zika virus articles, chiefly penned by Jon Rappoport, whose spend over 30 years investigating frauds pushed by the medical sick-care system. 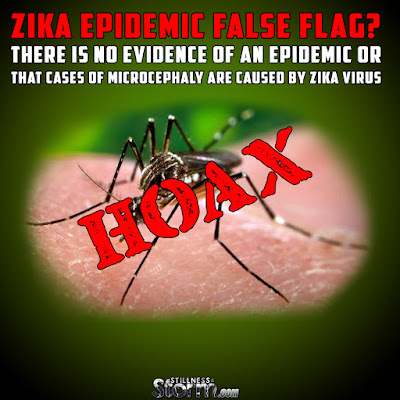 What Rappoport demonstrates there is no tangible evidence to connect the Zika virus with microcephaly, the medical condition describing abnormally small heads of newborn children. The condition can be caused by any number of 'insult' to the fetus during pregnancy, such as "a toxic drug, a toxic pesticide, the pregnant woman falls down a flight of stairs." So-called medical experts have associated Zika virus to microcephaly with no supportive evidence; there is no causal relationship with Zika and microcephaly being demonstrated, only baseless claims. Zika virus was discovered in 1947 and later patented by the Rockefeller foundation. Some companies even allow one to purchase Zika virus for laboratory purposes, and some have claimed that GMO mosquitos could be carriers of the virus. Related 1947 Rockefeller Patent Shows Origins Of Zika Virus: And What About Those Genetically Modified Mosquitoes? But as Rappoport reveals, there is no epidemic of actually taking place. The World Health Organization's recent press release claiming that a major epidemic of Zika virus spread to over 24 countries is completely unfounded. There were only 17 instances of 'Zika association' out of over 4,000 reported cases of microcephaly in Brazil. That doesn't qualify as an epidemic. In addition, since Zika virus has been well known since the mid 20th century, and has been documented in many different countries all over the world, it seems more likely that the virus was already present in the population. Claims that recent cases are due to an epidemic do not take into account pre-existing pathogenic exposure from other sources. All and all the picture painted is fairly clear for those with the eyes to see. The Zika virus is the latest false flag hoax pushed on to humanity to incite fear and reinforce confidence in the medical system. Considering that the real causes of microcephaly are most likely due to food toxicity and environmental pollution, the system of control can easily trick the masses into accepting a false epidemic exists, but only if the truth remains hidden. In light of this, let us spread the truth and transform this attempt at a false flag into one more red pill to further help our brothers and sisters awaken. Eventually, once the frauds of our age have been properly recognized, a wave of righteous indignation will sweep humanity, and then, finally, we will be empowered to change this world for the better. In my first book, AIDS INC.(1988), I indicated that covert medical ops are the most dangerous, because they appear to be politically neutral, they fly under no flag, and they claim to forward only humanitarian aims. But in fact, modern “Rockefeller Medicine” is built as a vast partner in the Globalization of the planet. Its vision is a universal in-utero-to-cradle-to-grave system for the human race: every human walks a bleak lifelong path of disease-diagnosis after diagnosis, receiving toxic drugs and vaccines at every turn, which weaken his body and mind, and make him unable to consider what is happening outside his perimeter of suffering or resist political totalitarianism. Again, I emphasize: The release of genetically engineered mosquitoes in Brazil, based on no health studies, is a crime, to say the least. But there is no need to claim these insects are causing an epidemic of microcephaly—since there is no evidence of an epidemic. There isevery reason to oppose this GE mosquito campaign. Explosive: The invention of an epidemic. This is an article that explains a great deal—but, with apologies, it involves a line of reasoning, in order to reach a conclusion. That means some readers (not my regular readers) may find it odd. Some readers with short attention spans may suddenly want to switch to a wrestling show or a shopping network. To them I say: give this a try; it does have a payoff; it has its own kind of shock and surprise; explosions do go off in the mind; it is like a ten-car pile-up on the interstate in the fog, late at night; and there is a very nasty plot. Even in those 17 cases, the mere presence of the Zika virus was no evidence the virus was causing microcephaly in 17 babies. A virus has to be more than “present.” It has to be there in huge numbers in an individual human. And the Brazilian researchers haven’t provided any evidence that Zika was present in huge numbers in any of the 17 babies. There is more. The whole effort of the researchers was to show, if possible, that Zika was present in all the 404 microcephaly cases. You see, they were doing preliminary work. They were looking for the cause of microcephaly. And when you’re on that kind of hunt, you’re trying to find some factor that is present in most or all cases. Otherwise, it’s not the cause. The Zika hunting expedition failed miserably. The researchers actually showed that Zika wasn’t the cause. Let me put it to you this way. 400 tourists staying a hotel fall ill with the same symptoms. Researchers try to find the cause. They propose, as a preliminary idea, that the tourists all ate apple sauce. So they interview the sick tourists, they examine the contents of their stomachs, they talk to kitchen workers—and they discover only 17 of the 400 tourists ate apple sauce. Conclusion? Apple sauce is not the cause of the illness. There is no reason to claim it’s the cause in the 17 people who ate it, either. Apple sauce, as an explanation, is a complete dud. All right. So we have no evidence that there is a widespread epidemic of microcephaly. And for those cases that do exist, we have no evidence, so far, that Zika virus is the cause. Given all this, a few new questions naturally arise. How did the notion that Zika virus might be the cause suddenly appear in the first place? And who started the story that there was an epidemic of microcephaly? Let me take up that second question. Apparently, several doctors at two or three hospitals in Brazil noticed more babies with microcephaly than usual. Their report went to someone at the Brazilian health authority. And then a call went out all over the country asking for reports of cases of microcephaly. Those reports came in. They weren’t necessarily accurate. When the numbers were added up, they came to more than 4000. Then, researchers began to sift through 3,670 of those reports to see what was actually happening—and so far, they see only 404 cases of microcephaly. Now let’s look at the first question: who proposed the apple sauce? Who proposed the idea that Zika, a virus known about since 1947, a virus which had never been known to cause more than mild transient illness, a virus surely present in humans all over the planet, was now suddenly wreaking great devastation in babies—deformity, brain damage? Who made that very strange leap? In May 2015, Brazil reported its first case of Zika virus disease. Since then, the disease has spread within Brazil and to 24 other countries in the region. This is clearly a deception. The first Zika case in Brazil, for a virus that’s been known about since 1947? In India, Zika has been known about (“Zika Fever”) for a long, long time. Discovering “the first” Zika case in Brazil has some special meaning? As I stated above, it’s well known that the virus causes only mild illness and goes away in a short time. So why would anyone care about a Zika case in Brazil? As for the WHO assertion that Zika has subsequently spread (like an epidemic) throughout Brazil and 24 other countries, this is absurd. It would be like saying, “We discovered a person driving a Volkswagen in Brazil. Since then, the occurrence of people driving Volkswagens had spread across Brazil and 24 other countries.” No, the drivers and the Volkswagens were already there. Why would researchers at WHO make this fundamental error? Why would they make this preposterous claim? Part of the reason leads back to a preoccupation with (actually, an obsession with) hunting for viruses. Hunting for them, finding them, and then, based on no solid evidence, claiming they cause various disease-conditions. Arrival of the virus in some countries of the Americas, notably Brazil, has been associated with a steep increase in the birth of babies with abnormally small heads… A causal relationship between Zika virus infection and birth defects and neurological syndromes has not been established, but is strongly suspected. Notice the use of the phrase, “associated with.” This is not true, as we’ve seen, because the Brazilian researchers have found the Zika virus (or indirect evidence of it) in only 17 of the 404 confirmed cases of microcephaly. There is no association. There is disassociation. Remember, in order to begin to say a particular virus is causing a disease, you must find it in almost all, or all, cases of that condition. What WHO is pointing to, re Zika, doesn’t even begin to approach this standard. And as you can see from the above quote, WHO admits they have established no causal connection between Zika and microcephaly. Yet WHO has been spearheading the drive to blame Zika and, yes, invent the idea that there is a “spreading epidemic” of Zika. Much of what you’re reading and seeing in the mainstream press about this “epidemic” comes directly out of WHO press releases and director Margaret Chan’s remarks. WHO is determined to fabricate a viral epidemic and its causal connection to microcephaly. Notice the date mentioned in the quote—May 2015. That’s when “the first case of Zika” was discovered in Brazil. WHO sent people to the scene immediately. They sent their virus hunters from GOARN, which is the WHO equivalent of the CDC’s Epidemic Intelligence Service (EIS). The virus hunters. Show them a situation; they will find a virus and make an warranted claim about it and push the story forward. That’s what they’ve done, against all the counter-evidence. They’ve invented a epidemic that doesn’t exist, blaming it on a virus that has never caused serious illness, and they’ve connected that virus, with no evidence, to microcephaly. But the biggest public-health agency in the world is sticking to its story about the 20-car crash and its “association” with the boy walking his dog. This does not indicate a mere error. This indicates a fixation. “We must find a virus and claim it is the cause.” It also indicates an intention to fabricate. All right. We’ve now reached the end of the first part of my argument. Let’s proceed and go to motive. For that exposition, I rely on the very well-known consequences of WHO making its entirely unwarranted and bogus case: an epidemic can be announced. They (WHO) can claim there is an epidemic caused by a spreading virus. Follow me here. This is crucial. Merely saying there are some microcephaly cases in Brazil, and they can come from many different causes—since any insult to the developing fetal brain can bring about microcephaly—a toxic drug, a toxic pesticide, the pregnant woman falls down a flight of stairs—merely saying there are some microcephaly cases in Brazil creates no appearance of a contagious epidemic spreading around the world. For WHO, that’s a non-starter. It goes nowhere. But linking microcephaly to a virus and then “discovering” the virus has “broken out” of its “previous containment in Brazil” and is “traveling around the world” and is “causing microcephaly”— now WHO is in business. Constructing these several garish lies and hooking them together achieves multiple objectives. The people at WHO may be crazy, but they aren’t stupid. They understand how much hay they can make through their invention. With the fairy tale about a galloping virus and its potential to create, in any pregnant woman, brain damage to her developing baby, they have a scary epidemic to run and manage and control. They have work, in the same way a movie director has work with a good script that can sell vs. one that won’t. Their allies can rush to develop a (completely unnecessary) vaccine. When the vaccine is ready (ready to make large profits), WHO can run that operation, too, by issuing all sorts of alerts about the need to get vaccinated. WHO can also issue “health directives” about “prevention” to every national government on Earth, thus cementing its superior role as a leading planetary command-post. In past articles, I’ve examined destructive agendas coalescing around multiple factors: toxic vaccines; the promotion and induction of illness; “the virus” as a cover story invoked to protect, for example, mega-corporations that poison populations with pesticides; the in-utero-to-cradle-to-grave system of toxic medical care, and so on. In this article, I just want to show how the invention of an epidemic occurs, how it’s done. How it’s put together. This is one aspect of the medical Matrix right in front of your eyes: the twisting and curling and distorting and forcing of disparate data into one coordinated scenario that, on analysis, completely falls apart. The author of three explosive collections, THE MATRIX REVEALED, EXIT FROM THE MATRIX, and POWER OUTSIDE THE MATRIX, Jon was a candidate for a US Congressional seat in the 29thDistrict of California. He maintains a consulting practice for private clients, the purpose of which is the expansion of personal creative power. Nominated for a Pulitzer Prize, he has worked as an investigative reporter for 30 years, writing articles on politics, medicine, and health for CBS Healthwatch, LA Weekly, Spin Magazine, Stern, and other newspapers and magazines in the US and Europe. Jon has delivered lectures and seminars on global politics, health, logic, and creative power to audiences around the world. You can sign up for his free NoMoreFakeNews emails here or his free OutsideTheRealityMachine emails here. Apparently the zika virus started in Uganda back in 1947 where is was found in monkeys.. Blood samples were taken from the monkeys and freeze-dried and are now on sale… presumably for researchers to use in vaccine testing. According to Aangirfan: The Uganda/East African Virus Research Institute, in Entebbe, Uganda, was established in 1936 by the Rockefeller Foundation. The institute has a field station at the Zika Forest near Entebbe. In 1947 scientists placed a rhesus macaque in a cage in the Zika Forest, near the institute in Entebbe, Uganda.